It’s been a while since I made a cake for Paul’s birthday. Last year we were on the road to Reno for a Lake Tahoe wedding — and unfortunately also received a speeding ticket — so baking a cake before a trip was out of the question. We decided to play it low key this year especially with an impending trip. So I thought it was time clear off the cobwebs and bake Paul a cake. And attempt to decorate it too! Paul is avid collector of HeroClix, a figure-based strategy game using the images of Marvel and DC characters. I thought it would be fun to try and replicate a base using black fondant and build around that. This was a major project. I found black fondant and rolled it out to cover the cake. I kind of screwed up trimming the fondant off of the bottom of the cake and added turret-looking sides. That worked out in the end since HeroClix has a dial that resembles it in the finished cake. 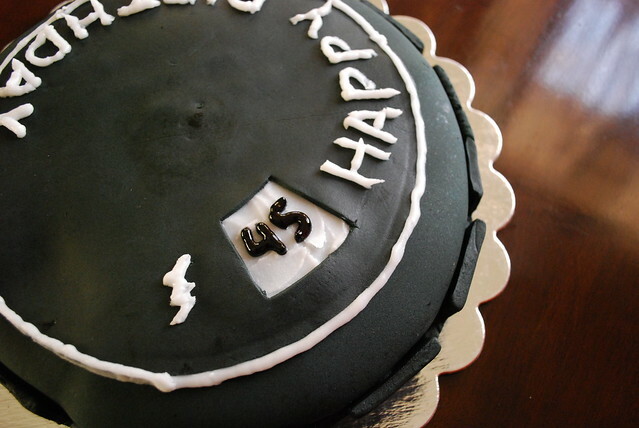 The toughest part was icing the words “Happy Birthday.” And do you see the 45? In HeroClix talk, that’s how much damage a figure can deal in a turn. On the cake, it’s Paul’s age. 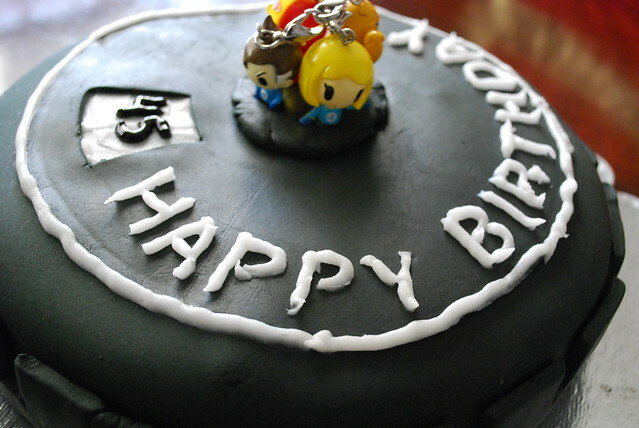 I also initially placed a few Tokidoki Fantastic Four figures on the cake but it looked chintzy with the dongles popping out of their heads. In retrospect, there was a too much fondant on the cake. Black fondant coats the inside of your mouth for several hours and, ahem, affects other bodily functions. 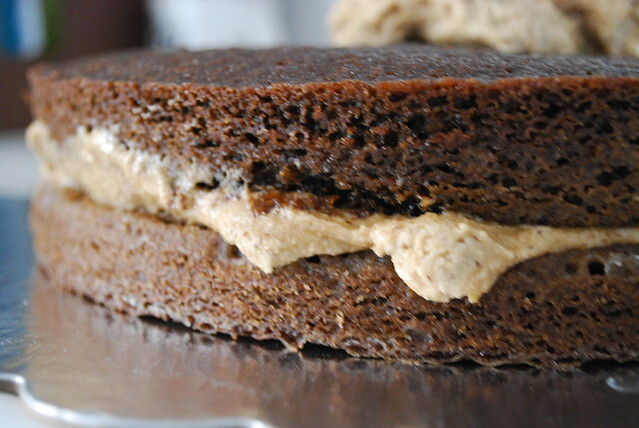 The cake was coffee-infused incorporating coffee grounds in the batter and buttercream icing adapted from a recipe from Pioneer Woman. I reduced the sugar in the cake by half (the original amount calls for two cups) since the icing falls on the sweet side. Plus I prefer my coffee to be on the bitter side. There’s no doubt that this cake is flavored with coffee. Instant coffee crystals are incorporated into the batter and also the icing. It’s a very moist cake and with easy instructions. If you prefer a less intense coffee flavor, I suggest dialing back on the amount of coffee crystals. We had a piece on Paul’s birthday eve and were buzzed for several hours. Preheat oven to 350 degrees F. Grease two round baking pans and line with parchment paper. In a large bowl, mix sugar, flour, and 1/4 teaspoon salt. Set aside. Melt 2 sticks of butter in a pot over medium-low heat. While that’s melting, add 3 tablespoons instant coffee to 1 cup boiling water. Set aside. Once butter has melted, add coffee mixture to the butter in the pot. Let it come to a boil for about ten seconds, then turn off the heat. Let cool slightly for 5 minutes. In a separate bowl, add buttermilk, eggs, baking soda, and vanilla. Mix until well combined. Pour the butter/coffee mixture into the flour mixture. Stir the mixture together gently. Add in the egg mixture and stir gently until well combined. Then pour into pans. Bake for 20 to 28 minutes or until set. Combine all icing ingredients, then ice the cake. Chill for an hour before serving. I love making coffee desserts but late night caffeine buzzes are rough. Do they make decaf instant espresso? Happy Birthday to Paul from me, Bert and TC! 🙂 What a cool looking cake and I like the Toki characters on top too! You’re right about fondant, it doesn’t taste very good. Happy birthday to Paul! Bravo to you for using all that fondant – fondant and I are not really close friends. It looks great though and the coffee flavor sounds terrific – even if it gives you a buzz.